August 3, 2017	Eddie Villanueva Jr.
I’m a huge Stephen King nut. I’ve read just about every book, short story, and anthological work he’s done since I was in diapers. (Yes, I could read while I was still in diapers. No, you can’t ask more about that.) So it’s easy to say that when The Dark Tower film was announced, I was beyond elated. Well, elated, I went in, and disappointed, I went out. Directed by Danish filmmaker Nikolaj Arcel, The Dark Tower follows Roland Deschain (Idris Elba), the last Gunslinger, who is locked in an eternal battle with Walter O’Dim (Matthew McConaughey), also known as the Man in Black. Accompanied by a young boy, Jake Chambers (Tom Taylor), the Gunslinger must prevent the Man in Black from toppling the Dark Tower, the key that holds the universe together. With the fate of worlds at stake, two men collide in the ultimate battle between good and evil. I sat in the theater, excited to finally get an on-screen adaptation of King’s trans-dimensional epic, and finally seeing the Gunslinger in the flesh. As soon as the final credits ran, and the screen transitioned to darkness, only one thing ran through my mind: IS THAT ALL?! I stood up and actually said those words out loud, not to the surprise of other critics in the theater, who were saying other words I dare not write in this article. I had my heart set on seeing this incredible work of art translated into a masterpiece of a film, utilizing an outstanding cast to bring the long-awaited foes to life, and see what I had only envisioned in my mind after reading every story. What we get is a short walk on a very long pier. Ok, let’s talk about some of the key elements of the film. The Dark Tower boasts some incredible writers, including Akiva Goldsman (2004’s I, Robot, 2001’s A Beautiful Mind, 2005’s Cinderella Man) and Jeff Pinkner (TV shows Alias, Lost, and Fringe). Unfortunately, it seems that the writers were given a ton of material, and only a small amount of time to implement it. The film stands at a mere hour and 35 minutes, much shorter than what many fans had anticipated from the Tolkien-esque tale. With such a rich and deep pool to draw from, the story should’ve done its part in creating a foundation for what’s to come for the film saga, one that could’ve easily rivaled the 3-hour time frame of 2001’s The Lord of the Rings: The Fellowship of the Ring. It’s not that I enjoy every extremely long film. It’s not the length of the film that matters most, it’s being able to produce a great work that, much like The Fellowship of the Ring, and give fans a reason – nay, give fans a burning desire – to want to come back to the theaters the moment the sequel drops, allowing moviegoers to quench the thirst left by the previous film. There are many films out there that, despite boasting long time frames, completely missed the mark f0r me, and became annoyances rather than accomplishments. The Dark Tower, sadly, left me in such a state of awe as to the lack of depth given to each character, that I felt the film was missing a whole hour of footage that would fill in the gaps. We already know that actors Idris Elba and Matthew McConaughey are incredible in their own right, as they’ve made names for themselves throughout cinema history. From stellar performances that range from cop dramas to sci-fi, both of these gentlemen have yet to be placed in a role where they don’t excel beyond expectations. It’s not as though their performances as the characters they portrayed weren’t good, but if you only give your star players so much time with the ball, you’re not going to win the game. That was the thing with The Dark Tower. The development of each character falls desperately short to suffice the average moviegoer, let alone those who are fans of the books. The film ended with an abrupt halt to the story, one that I found similar to the final scene of the series finale of The Sopranos. I wanted more to this story before I could even consider expecting a sequel. This film didn’t do that for me. There are a few bright spots in the film. The interactions that the Gunslinger has once he is on Earth are funny and amusing. The features and visual aesthetics of the “Skins,” the lackeys of the Man in Black, made for an interesting aspect to the film. This, however, fell short due to the lack of depth given to their whole part in the film. But, nevertheless, they still served as an interesting aspect of the story. I can say, however, that in my mind’s eye, I thought that there were no better persons to portray the Gunslinger and the Man in Black than Idris Elba and Matthew McConaughey, respectively. Elba has a quiet yet unbridled strength about him that seems to fit the bill for his role, and McConaughey has been primed to play this role ever since 2001’s Frailty. All in all, I feel like The Dark Tower left much to be desired, and sadly fell short of my basic expectations: setting the stage for the grand battle for all worlds against the armies of darkness. The struggle over the Dark Tower seemed a little vague for me to invest myself, emotionally, and became a backstory to a revenge story that seemed to drive the film more than it should have. 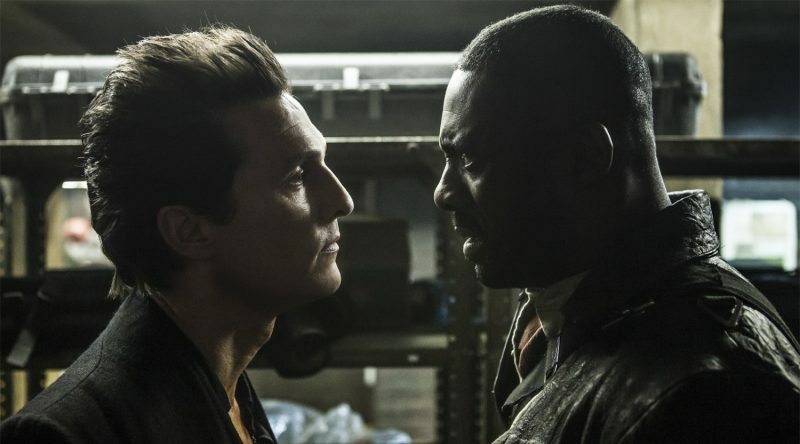 The Dark Tower carried all the right pieces and had all the green lights to be one of the greatest adaptations of Stephen King to date, but unfortunately, it fell short of just being average and serving fans what may have passed as the first episode of a TV miniseries. Here’s to hoping that with the upcoming Stephen King adaptation of It coming out in September, filmmakers and fans, alike, will be able to see what it takes to create a true to source material adaptation, and step up their game.